Be mindful of fatigue; this slow insidious dread that has caused many a pilot to lose their way. Fatigue, is the final frontier in our modern too-busy lives. No, seriously, from that threshold nothing is achieved, nothing improved and nothing is gained. Only problems ensue. It is a burnout, or feeling tired…minor change in mood, energy, or sleep; the lowest reaches of wellness. Fatigue is a symptom of your brain reaching a point of dysfunction…a large spectrum of dysfunction. The spectrum ranges from momentary blips on the radar of simply needing a break, a catnap for instance, or needing to eat lunch, to more severe, devastating, life-altering, neurodegenerative disorders of complete exhaustion…Yikes! There are two kinds of Fatigue: Acute (short-term) and Chronic (long-term). Short term acute fatigue is easily cured by a sound sleep and is a normal daily occurrence. The chronic fatigue however has deeper psychological roots and causes significant psychosomatic ailments, which can lead to long term disability from debilitation. Some of these include: tiredness, heart palpitations, breathlessness, headaches, or irritability. Sometimes chronic fatigue even creates stomach or intestinal problems and generalized aches and pains throughout the body and even depression. Self-help cures in these circumstances are rare. Above all, when in the throes of chronic stress, don’t fly! Timing disruption – Performing a task as usual, but with the timing of each component is slightly off, makes the pattern of the operation less smooth and fluid. There is a higher chance of disruption in finishing the task. Disruption of the perceptual field – You concentrate your attention upon movements or objects in the center of your vision and neglect those in the periphery. This leads to loss of accuracy and smoothness in control movements. The effects are magnified in high task saturated environments eg. turbulent weather in instrument conditions. Other symptoms include: memory fog (where did I leave my keys), difficulty following instructions, lowered retention, lack of motivation, tire easily, poor focus, emotional meltdown and psychosomatic pains and digestive complaints. And while it is felt in the peripheral muscles as weakness it is a central dogma arising in the brain; Brain (Central Governance Model-CGM) generates the sensations of fatigue during exercise (MIND OVER MATTER) – Fatigue is a Brain-Derived Emotion that Regulates the Exercise Behavior to Ensure the Protection of Whole Body Homeostasis. ( Timothy David Noakes,* Front Physiol. 2012; 3: 8) While initially fatigue causes a reduction in muscular force, the brain executes a second phenomenon of fatigue as a sensation. The central psychical station influencing the peripheral muscular network might appear as an imperfection, yet it is an extraordinary perfection of support and self-preservation. What is the ultimate antidote to Fatigue? Answer: SLEEP. Be mindful of the side effects of certain medications, even over-the-counter medications – where drowsiness or impaired alertness is a concern. Consult a physician to diagnose and treat any medical conditions causing sleep problems. Create a comfortable sleep environment at home. Adjust heating and cooling as needed. Get a comfortable mattress. When traveling, select hotels that provide a comfortable environment. Get into the habit of sleeping eight hours per night. When needed, and if possible, nap during the day, but limit the nap to less than 30 minutes. Longer naps produce sleep inertia, which is counterproductive. 6. Try to turn in at the same time each day. This establishes a routine and helps you fall asleep quicker. If you can’t fall asleep within 30 minutes of going to bed, get up and try an activity that helps induce sleep (watch non-violent TV, read, listen to relaxing music, etc). Get plenty of rest and minimize stress before a flight. If problems preclude a good night’s sleep, rethink the flight and postpone it accordingly. Consume alcohol or caffeine 3-4 hours before going to bed. Eat a heavy meal just before bedtime. Exercise 2-3 hours before bedtime. While working out promotes a healthy lifestyle, it shouldn’t be done too close to bedtime. Use sleeping pills (prescription or otherwise). Fatigue is a slow inebriation of senses and its harm lies menacingly in the wings. Early recognition and prevention is the key to flight safety! FAA Restores Aviation “Sim” Time! Training time credited by the FAA for flight simulation devices is a moving target caught in a web of regulatory confusion. Even the names and levels have been changed continuously as this process has evolved. Finally, the new rule will be published today April 12th, taking effect on May 12th with a strong move in the right direction. The FAA has restored the 10 hours of credit for BATDs (Basic Aviation Training Devices) and 20 hours for AATDs (Advanced) previously permitted by manufacturer LOAs. Time with a professional educator on even a modestly priced machine can provide a wide variety of challenges unavailable in flight with much greater efficiency, economy and safety. SAFE has advocated continuously for greater “sim” time credit. Since the 1970s, the FAA has gradually expanded the use of various forms of flight simulation for training. The venerable ATC-610 with realistic “steam gauge instruments” was a mainstay for training all kinds of approaches. Computer based training devices have dramatically expanded the realism and also the utility of these devices with companies like Mindstar even networking devices into a virtual environment (demonstrated at the Pilot Proficiency Center at Oshkosh last year). The realism of the new hardware is exceptional with motion incorporated in models from Redbird, Frasca and many other progressive manufacturers. SAFE has led the charge for approval of increased simulation credit and we are proud our proposal to the FAA is quoted extensively in the current NPRM. Flight simulation provides a huge opportunity for aviation educators and a superior, less expensive, training environment for clients at all courses and levels. For both initial and recurrent flight training, increased FAA credit for simulation is a huge win. Incidentally, the requirement for a “view limiting device” was thankfully dropped in the most recent rule (can’t see the ground anyway!) The FAA NPRM again mentioned helpful input from SAFE. Also, per 61.51 (g)4 you do need an “authorized instructor” (we presume that would be a CFII) to observe and sign your logbook to log legal training time or maintain currency. There was lots of confusing interpretations circulating but the recent legal letter of interpretation makes this abundantly clear. “Follow” this blog to receive notification of new articles. and write us a comment. And please Join SAFE in our mission of pursuing aviation excellence. Our amazing member benefits alone make this commitment painless and fun. Author David St. GeorgePosted on April 12, 2016 April 12, 2016 Categories UncategorizedLeave a comment on FAA Restores Aviation “Sim” Time! The planning and execution of this event is a core principle of SAFE and is a tangible example of what we as Aviation Educators are committed to each and ever day. Take a look at your schedule and if you can put these dates on your calendar and plan to join us for this important event. Also, as we move forward with our planning we will be asking for volunteers to help us with both the Symposium and in the Pilot Proficiency Center. If you have questions, comments or would like to volunteer please email Michael Phillips at mcfimlp[a]gmail.com. The most dangerous CFI is not necessarily the one you would expect! The person lacking skills or with a history of safety issues is usually obvious through reputation and avoided by serious pilots. The real sleeper is the popular CFI who is everyone’s friend and cannot say “no.” This CFI lacks the ability to set standards and firmly guide behavior with occasionally disappointing news. I know this sounds harsh but this person is too often giving away privileges that are not earned and compromising our whole safety culture. Being a professional necessitates some “tough love” and it’s usually uncomfortable to be the bearer of disappointing news (as a DPE these are my darkest days)! Sometimes hostility can occur no matter how gently you convey the need for “more training” but it is a necessary burden of the job and essential to aviation safety. Many clients are (unfortunately) “shopping for a yes” or permission to get signed off for a test or to fly their shiny new plane. The “tough love” of necessary skill and knowledge can be a bitter pill keeping them from their goal. But every CFI conveys amazing power with each endorsement placed in a logbook and holds the keys. That privilege granted cannot be a gift but must be earned through demonstrated skill, knowledge and judgment. Most new flight instructors start out with this tendency due to a need to please and to acquire new students. The “newbie CFI” will fly at any hour and endure all kinds of abuse from students (those who are chronically late and unprepared) to generate business. This usually leads to a chaotic co-dependency and the student training fails to progress. This new instructor will be very busy and popular but generates no progress in student skills. Safety can be seriously in question while this new CFI learns to calibrate their standards and gains confidence. This is one reason why CFI oversight or mentoring is so vital for new instructors. This same “need to please” can also happen with an entire flight school. Most often this is “the new guy on the block” with shiny equipment and an attractive new facility. This school can sometimes be desperate to attract new students and make money rather than create safe pilots with real skills. For the parents among our readers think “spoiled child” and the modern cultural meme of “everyone is above average” deserving of a trophy. Successful flight training requires a little “tough love” to be safe. Privileges must be earned not purchased. Hopefully, as a new CFI (or school) grows and becomes more confident and knowledgeable, they realize the need to set real standards and emphasize the personal growth of skill, knowledge and judgment in their students. Unfortunately, I have also met the CFI that never gets the message and continues to massage everyone’s ego and promote “universal happiness” over true aviation safety and progress toward a rating. If you are a client or student, watch out for the “pathological pleaser” who too easily gives away privileges you do not earn. There are no gifts in aviation and safe progress requires some serious work and discipline to earn achievement. If your CFI is overly helpful or continuously complimentary, seek a new coach on your way to your certificate or rating. And for your flight review find someone that makes you work, your personal safety hangs in the balance. “Follow” this blog to receive notification of new articles. and write us a comment. And please Join SAFE in our mission of pursuing aviation excellence. The amazing member benefits alone make this commitment painless and fun. 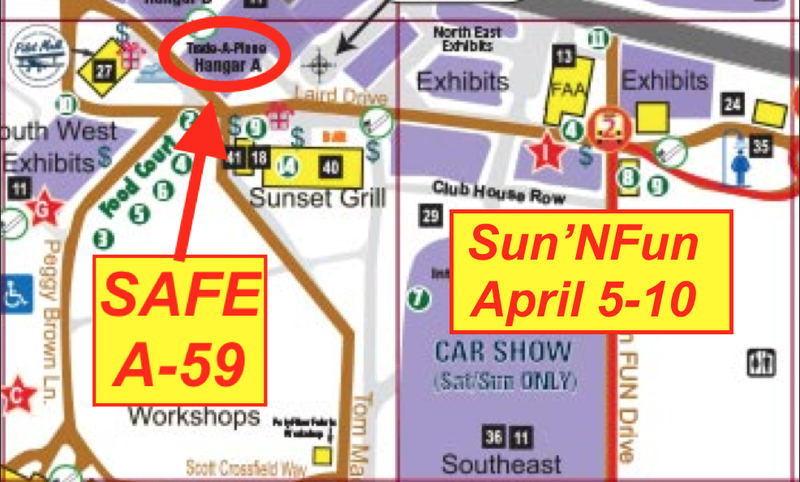 See you at Sun ‘N Fun Hangar A Booth 59. Author David St. GeorgePosted on April 1, 2016 Categories Uncategorized1 Comment on SAFE Working For You! Visit Us at Sun ‘N Fun!